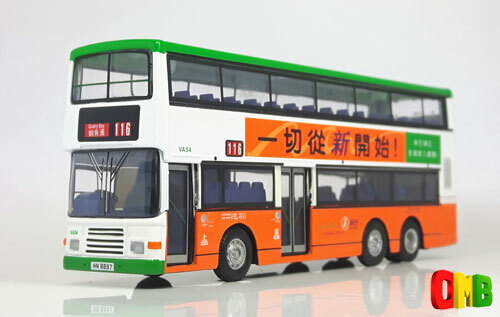 The model - This was the second New World First Bus (NWFB) model to be released and the first of a set of three Olympians, announced in early December 1998, which carry cryptic banner adverts for the then new company. This model carries the advert 'This bus has ears' in large lettering, and 'Our hotline is 2136 8888' in small lettering, emphasising the high priority the new company was giving to customer care. 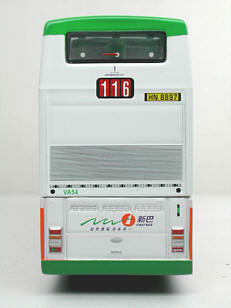 The nearside carries the same message, but in Chinese. The model correctly represents an 11 metre vehicle and was released in Hong Kong in December 1998. It was not issued in the UK. 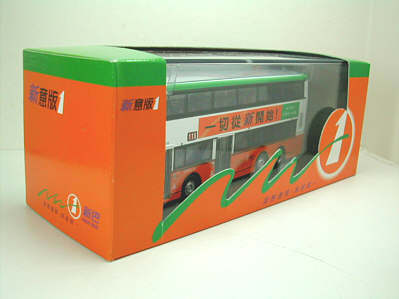 Corgi initially allocated the product code of this model (43211) to Kowloon Motor Bus and the model, which was due to be released in June 1998, was to carry Long Win 'Airbus' white/red livery. Further details on this topic can be found by following this link. 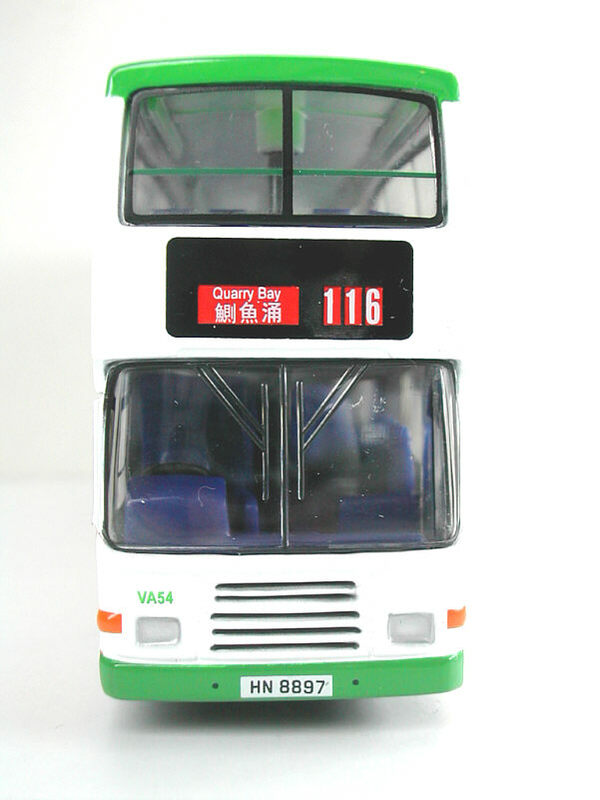 Details of the pre-production version of this model can be found by following this link. 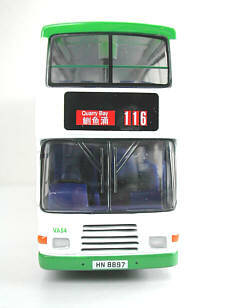 The bus - VA54 was acquired by NWFB on 1st September 1998 when it took over the franchised bus operations from China Motor Bus (CMB). It was new to CMB in January 1998, being one of the final batch of 14 such vehicles. 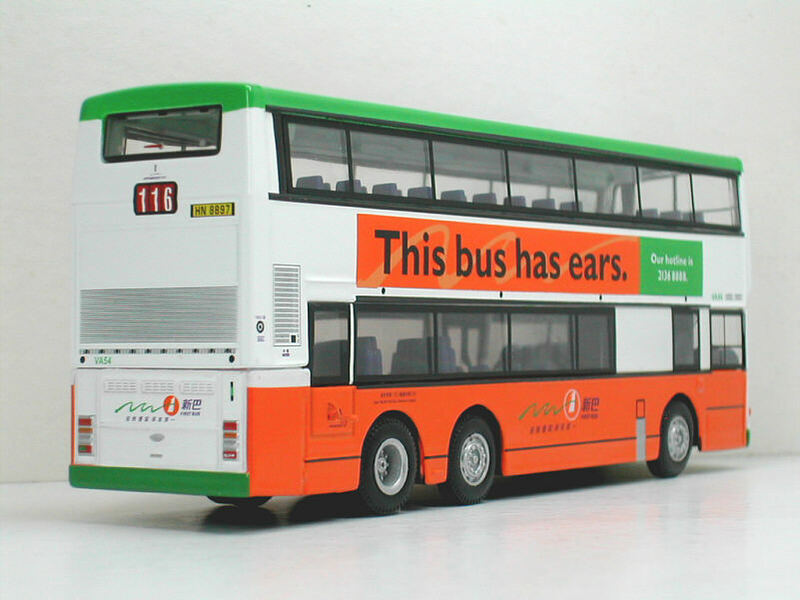 After the initial batches of new NWFB vehicles in 1998, which carried the full 'wave' livery (see 44401), buses acquired from CMB were subsequently repainted, omitting the 'wave', thus enabling greater advertising space between the upper and lower decks.